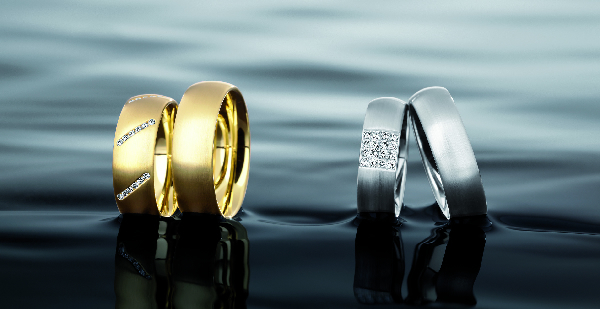 Christian Bauer wedding rings considers itself a high-quality manufacturer for the premium market. Hand made with individual inspection by our master craftsmen in Welzheim, Germany, only Gold, Platinum or Palladium and diamonds of the highest quality are used by Christian Bauer to produce capitivating rings; a fact which has been recognized in numerous wedding ring magazines. Christian Bauer has been in business since 1880. "No ordinary love - No ordinary ring." We at Christian Bauer love lovers. We do not just make rings of acceptable quality. We insist on creating beautiful wedding rings without compromise. The artisans in our company share our commitment. Only the finest is good enough for those who have found such love that they wish to spend the rest of their lives together. Today's cutting edge technology is combined with the craftsmanship that comes from one hundred and twenty eight years of experience. This potent combination is manifested in perhaps the world's most perfect, beautiful and desirable wedding rings.